One of the biggest promises of modern DNA sequencing methods is the ability to track the adaptation of living populations at a fine genetic scale, in essentially real time. It’s already been done in a number of experimental evolution systems: collect lots of DNA sequence data from a population, subject that population to selection, then sequence its selected descendants and compare them to the pre-selection sequences to identify genetic variants that became more common over the course of adaptation. More and more, it’s getting to be possible to do that in the—I would say—more interesting case of natural populations responding to selection by conditions we may not even know with any specificity. A paper in the latest issue of Molecular Ecology is a nice example of the possibilities from an in nature “evolve and re-sequence” study—but it also shows how much work will be necessary to truly realize the promise of the approach. The paper, by Vincent Bourret, Mélanie Dionne, and Louis Bernatchez at the Université Laval and the Ministère des Forêts, de la Faune, et de Parcs in Québec, Canada, tests for adaptive genetic change over the course of a single generation in Atlantic salmon. Salmon are interesting as an economically important species, but their lifestyle also makes them particularly suitable for fine-scaled studies of adaptation. 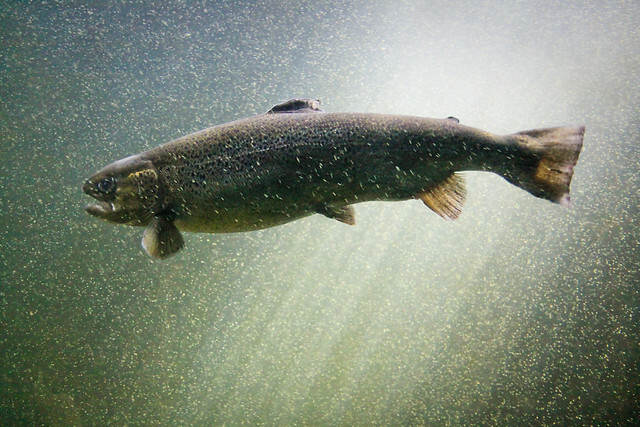 Atlantic salmon are anadromous, meaning they split their lifespan between freshwater environments and the ocean. Salmon hatch in freshwater rivers, and spend at least their first year in that environment before swimming downstream to the ocean, where they develop into reproductively mature adults. When they’re ready to mate, they migrate back from the ocean, up the river where they hatched to spawn at the site of their birth. Those major migrations and the transitions between freshwater and salt-water are likely to be major selective events for salmon, and they offer convenient times to catch and study salmon from roughly the same age-cohort: when they migrate downstream to the ocean, and when they return to their birth-river. Bourret et al. took tissue samples from juvenile salmon, or smolts, migrating into the North Atlantic from the mouths of the Trinité and Saint-Jean Rivers in coastal Québec, and also from adults returning to those rivers after at least one year at sea. Over three years, they sampled fish from two smolt-adult cohorts. They genotyped the fish tissue samples at 5568 single-nucleotide polymorphism (SNP) markers using a genotyping array designed for salmon, and calculated FST at each SNP marker as an index of differentiation between smolts and adults in each year, and at each river. That’s a nice experimental design, because it has built-in triangulation, or validation of the genetic results. The inference is that SNPs with unusually high differentiation between smolts and adults are likely to be located in parts of the genome where salmon with some genetic variants were better able to survive and return to the spawning grounds. If the same SNPs turn out to be strongly differentiated at different rivers, and in different years, then some common selective force created by life at sea is (probably) consistently acting on the same genome regions. In fact there were no highly-differentiated SNPs in common across more than two of these possible comparisons. This could mean that there simply is no significant selection acting on salmon during smolt-to-adult development in the ocean—but that seems unlikely. It could also reflect the fact that different genetic factors determine survival in different populations and in different years. That’s certainly consistent with an enormous body of previous research showing that selection can vary from place to place, and even from year to year in the same location. But I suspect that the more important issue is that this “genome scan” is underpowered. That is, the SNP array Bourret et al. used doesn’t sample enough of the genome to say that, simply because no replicated differentiation is detected, that none exists. The array genotypes 5,568 SNPs, which is certainly more markers than were available just a few years ago. On the other hand, the estimated size of the Atlantic salmon genome is 3 billion nucleotides—if the single-nucleotide markers are distributed evenly across that genome, that’s about one SNP every 550,000 nucleotides! The paper reporting the original development of the array says that it started with a library of expressed sequence tags, which means that the SNPs are probably concentrated in protein-coding gene regions. That implies that many of the markers are more clustered than random, and the FST “scan” is really just for differentiation in genes; I’d still say we can’t assume it’s an exhaustive search for differentiated regions. Fortunately, Bourret et al. didn’t stop at the FST scan. They also tested for coordinated differentiation at multiple markers, by identifying groups of markers at which variation was correlated across their entire sample. They then tested each of these groups of markers for differentiation between the two different sampling sites, between different years, and between the smolts and adults. This multivariate approach demonstrated that the largest proportion of variation, by far, was best explained by differentiation between salmon from the two different rivers—essentially, population structure. The next-largest factor, though, was explained by differences between smolts and adults, and an interaction between life stage and rivers. That, I think, is a truly genome-wide indication that selection may be acting on the salmon as they grow up in the ocean. (And that the nature of selection, or the genes affected by it, may differ between salmon populations.) But it’s a very broad-scale signal. Thirty-four specific, co-varying SNP markers are identified by the multi locus approach, but these markers don’t lie in genome regions with clear connections to particular traits or metabolic processes. Bourret et al. conclude that their results are consistent with selection acting on traits created by many loci with small individual effects, and this is certainly true. However, I suspect that loci with fairly substantial effects could still slip through the genomic “net” the authors have used—it doesn’t so much show the inefficacy of a genome scan, as what happens when your genome scan doesn’t examine large parts of the genome. In the end, this study is more an outline for what would be possible with finer-scale marker data than a specific description of adaptive genetic change. For another view on this paper, see the accompanying commentary by friend-of-the-blog Katie E. Lotterhos and Sara M. Schaal. Bourret, V., M.P. Kent, C.R. Primmer, A. Vasemägi, S. Karlsson, K. Hindar, P. McGinnity, E. Verspoor, L. Bernatchez, and S. Lien. 2013. SNP-array reveals genome-wide patterns of geographical and potential adaptive divergence across the natural range of Atlantic salmon (Salmo salad). Molecular Ecology. 22:532–51. doi: 10.1111/mec.12003. Bourret V., M. Dionne, and L. Bernatchez. 2014. Detecting genotypic changes associated with selective mortality at sea in Atlantic salmon: polygenic multilocus analysis surpasses genome scan, Molecular Ecology, 23(18) 4444-57. doi: 10.1111/mec.12798. Burke M.K. 2012. How does adaptation sweep through the genome? Insights from long-term selection experiments. Proc. Royal Soc. B. 279:5029-5038. doi: 10.1098/rspb.2012.0799. Davidson W.S., B.F. Koop, S.J.M. Jones, P. Iturra, R. Vidal, A. Maass, I. Jonassen, S. Lien, and S.W. Omholt. 2010. 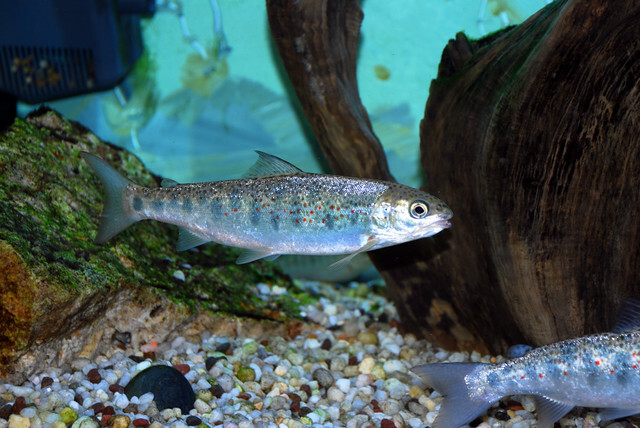 Sequencing the genome of the Atlantic salmon (Salmo salar). Genome Biology. 11:403. doi: 10.1186/gb-2010-11-9-403. Lotterhos K.E. and S.M. Schaal. 2014. Genome scans for the contemporary response to selection in quantitative traits. Molecular Ecology. 23:4435-7. doi: 10.1111/mec.12853. This entry was posted in adaptation, association genetics, genomics and tagged Atlantic salmon. Bookmark the permalink.